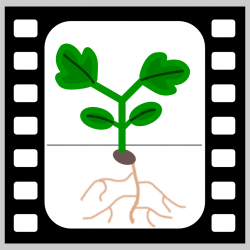 This is a time lapse video of a fava bean growing, but partway through, the top of the plant (the apical meristem) is cut off. This breaks the apical dominance that is generated by the apical meristem’s production of auxins. After an adjustment phase, the lateral meristems are no longer inhibited and begin to grow at two of the nodes.